Iron Girl sent me two packs of their new release, energy bars made with women's nutrition in mind. Iron Girl event series is comprised of 13 races nationwide, ranging from shorter distances like the 5/10k to half marathhon, duathlon, and triathlon. Iron Girl is part of World Triathlon Corporation, producers of the Ironman World Championship in Kailua-Kona, Hawaii. It makes sense that with all these events for women, they'd figure up an energy bar for their audience base. So, teaming up with Power Bar, they've released two flavors of fortified energy bars you can eat to fuel up a workout, or satiate your hunger between meals during a busy day. 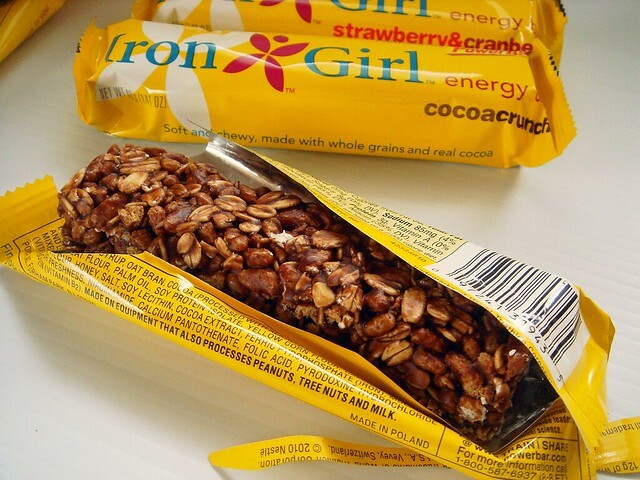 With women's nutrition in mind, Iron Girl made sure to include some essential minerals to help us stay strong. Containing calcium, iron, and B vitamins, you have a nutrition packed energy bar that provides taste and substance. Iron Girl energy bars contains 40% of the Daily Value (DV) for iron, 20% DV for calcium, and the B vitamin blend contains: 45% DV riboflavin, 35% DV niacin, 40% DV vitamin B6, 20% DV folate, and 25% DV pantothenic acid. As we all know, iron is important to the female athlete, as iron deficiencies greatly affect our performance. Iron helps carry oxygen around the body and muscles. If your iron stores are low, it can cause fatigue and negatively impact performance, not just during workouts but throughout the day. Calcium plays an important role for bone health. Inadequate calcium effects include low bone mineral density and stress fractures. B vitamins convert food to energy. Adequate B vitamin intakes is important to ensure our energy production remains revved and help our bodies build and repair muscle tissue. So not only do the bars taste good, but they're good for you, too. Two birds with one stone. Their bars, made with whole grains, real fruit, and cocoa, are soft and chewy and lightly sweet. The two flavors, strawberry & cranberry and cocoa crunch are available at Target beginning mid-April, $0.99 for individual bars and $4.99 for a six pack. Power bar is also offering a special on their website. 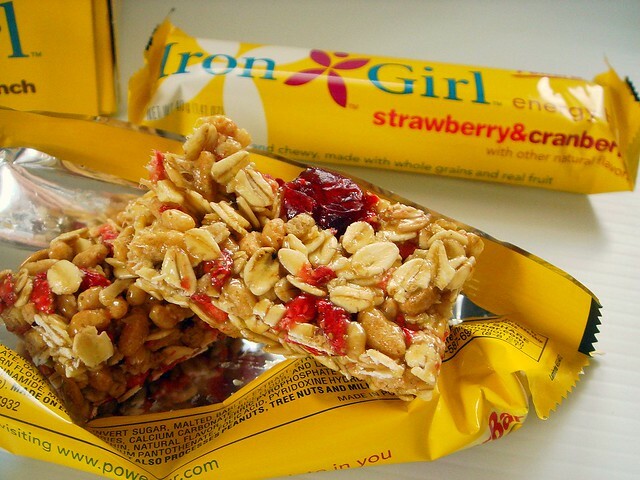 Register on www.powerbar.com/irongirloffer and receive a "buy one, get one FREE" coupon. My favorite flavor between the two was the strawberry & cranberry. The bar was studded with fruit pieces. I liked the contrast between the tart cranberries and chewy, sweet oats, and who can resist strawberry? This bar was 160 calories, not really enough for a snack but enough to get me through a run if I'm a bit on the hungry side. It wasn't heavy and didn't sit like a log in my stomach. I ate 1 1/2 bars about 45 minutes before going out on a 4 miler, and it never felt like I could feel the effects of the bar in my stomach, like ingredients that made you feel bloated and didn't digest quickly. A definite plus. Next up was the cocoa crunch, a bar made from the same chewy whole oats, plus crispy rice cereal and cocoa powder. To me, this bar tasted deeply earthy and it didn't seem as sweet as the strawberry bar. I didn't really enjoy this one as I felt that it lacked enough sweetness to balance the cocoa so I probably won't be buying it on my own. One of my brothers liked it, though, so it's definitely an individual thing. I just likened it to a taste I didn't want in sweet foods. 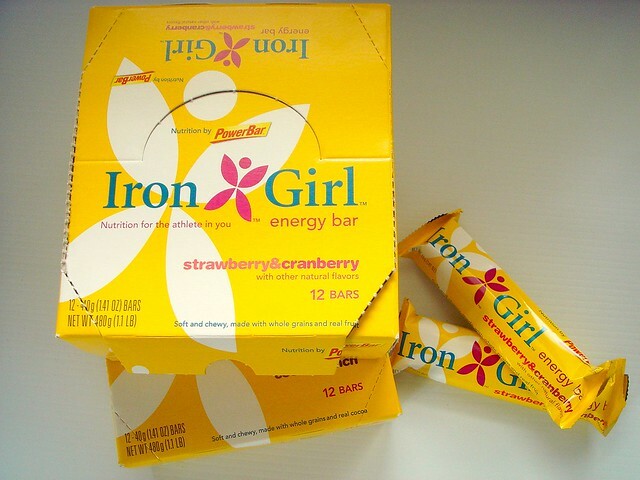 If you are looking for a new bar to try, check out these Iron Girl bars. Thank you again for letting me try them out! yum these sound great--and i love that they're made specifically for women! Thanks for reviewing, I'll have to check these out. I always struggle with keeping my iron levels up, so every little bit helps! Natalie - They were good. I like products that seem like they're personalized, too. Kristyle - Glad to spread the word! I hear you on the low iron. I can't find the Strawberry/Cranberry ones anywhere anymore!! HELP! !